Southampton have failed to win in their last 12 matches in Premier League. Liverpool have scored in each of their last 8 matches in Premier League. Southampton have drawn their last 3 home matches in Premier League. Brighton & Hove conceded at least 1 goal in 71% of their home matches in Premier League. Southampton conceded at least 1 goal in 71% of their home matches in Premier League. Brighton & Hove have scored 63% of their goals in the first half in Premier League. Chelsea did not concede any goal in 57% of their away matches in Premier League. Southampton have failed to score in 43% of their home matches in Premier League. Chelsea have scored in 86% of their away matches in Premier League. Southampton have failed to win in their last 7 home matches in Premier League. Arsenal have been undefeated in their last 14 matches in Premier League. Chelsea were leading at halftime in 62% of their matches in Premier League. Arsenal have scored in each of their last 15 matches in Premier League. Liverpool were leading at halftime in 62% of their matches in Premier League. 81% of Manchester Utd’s matches had over 2.5 goals scored in Premier League. Arsenal have scored 2 goals or more in each of their last 7 away matches in Premier League. Liverpool have won their last 5 matches in Premier League. Arsenal have scored in each of their last 7 away matches in Premier League. Liverpool have been undefeated in their last 16 matches in Premier League. Manchester Utd have scored in each of their last 8 away matches in Premier League. Arsenal have been undefeated in their last 6 away matches in Premier League. Liverpool did not concede any goal in 86% of their home matches in Premier League. 83% of Liverpool’s conceded goals were conceded away in Premier League. 74% of Arsenal’s goals have been scored in the second half in Premier League. 83% of Liverpool’s conceded goals occured in the second half in Premier League. Liverpool have scored the opening goal in 81% of their matches in Premier League. Chievo have failed to win in their last 15 matches in Serie A.
Fiorentina have failed to win in their last 8 matches in Serie A.
Empoli conceded at least 1 goal in each of their last 12 matches in Serie A.
Sampdoria conceded at least 1 goal in 71% of their home matches in Serie A.
Parma have scored 69% of their goals in the first half in Serie A. AS Roma conceded at least 1 goal in each of their last 7 matches in Serie A.
SPAL have conceded 2 goals or more in each of their last 5 home matches in Serie A.
Chievo have drawn their last 4 matches in Serie A. 74% of Fiorentina’s points have been earned at home in Serie A.
SPAL conceded at least 1 goal in each of their last 5 home matches in Serie A.
Chievo have scored in 71% of their away matches in Serie A. 44% of Fiorentina’s conceded goals occurred after the 75th minute in Serie A.
Empoli have scored in each of their last 7 matches in Serie A.
SPAL have failed to win in their last 5 home matches in Serie A.
Chievo have conceded the opening goal in 73% of their matches in Serie A.
Empoli have scored in 71% of their away matches in Serie A. AS Roma conceded at least 1 goal in 86% of their home matches in Serie A.
Genoa have failed to win in their last 9 matches in Serie A.
Genoa conceded at least 1 goal in each of their last 10 matches in Serie A. 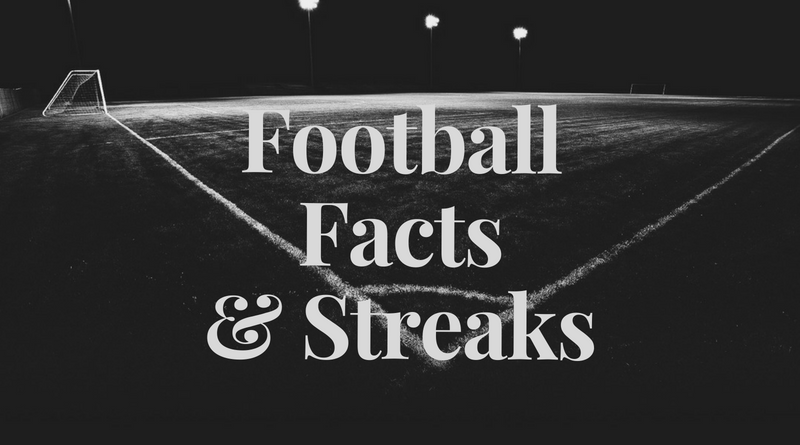 67% of Genoa’s matches had over 2.5 goals scored in Serie A.
Genoa have scored in 86% of their away matches in Serie A.
Empoli have scored 2 goals or more in each of their last 4 matches in Serie A.
SPAL conceded at least 1 goal in 71% of their home matches in Serie A.
Genoa have lost 71% of their away matches in Serie A.
FC Sevilla have been undefeated in their last 6 matches in La Liga. Huesca have failed to win in their last 14 matches in La Liga. Espanyol have lost their last 4 matches in La Liga. FC Sevilla have scored 63% of their goals away in La Liga. 67% of Real Betis’s matches had under 2.5 goals in La Liga. FC Sevilla have won their last 5 home matches in La Liga. 71% of Girona’s conceded goals were conceded at home in La Liga. Huesca conceded at least 1 goal in each of their last 15 matches in La Liga. Girona have scored in 71% of their away matches in La Liga. 75% of Real Betis’s goals have been scored in the second half in La Liga. Villarreal have scored 40% of their goals after the 75th minute in La Liga. Huesca conceded at least 1 goal in each of their last 7 home matches in La Liga. Villarreal conceded at least 1 goal in each of their last 9 matches in La Liga. Huesca have failed to win in their last 7 home matches in La Liga. Villarreal have scored in 71% of their away matches in La Liga. Huesca have scored 67% of their goals away in La Liga. 73% of Villarreal’s goals have been scored in the second half in La Liga. Huesca have failed to score in 57% of their home matches in La Liga. Villarreal have conceded 2 goals or more in each of their last 4 away matches in La Liga. Monaco have scored in 75% of their away matches in Ligue 1. Lille have scored 72% of their goals at home in Ligue 1. 77% of Monaco’s points have been earned away in Ligue 1. 71% of Bordeaux’s points have been earned at home in Ligue 1. 75% of Monaco’s goals have been scored in the second half in Ligue 1. Bordeaux have scored 74% of their goals at home in Ligue 1. Nimes have failed to score in 43% of their home matches in Ligue 1. 62% of Monaco’s conceded goals were conceded at home in Ligue 1. Nimes have scored 62% of their goals away in Ligue 1. 68% of Lille’s points have been earned at home in Ligue 1. RB Leipzig did not concede any goal in their last 5 home matches in Bundesliga. FSV Mainz have scored 31% of their goals after the 75th minute in Bundesliga. 41% of Frankfurt’s conceded goals occurred after the 75th minute in Bundesliga. 68% of RB Leipzig’s points have been earned at home in Bundesliga. Frankfurt have scored in 100% of their home matches in Bundesliga. 76% of Frankfurt’s conceded goals occured in the second half in Bundesliga. 77% of RB Leipzig’s conceded goals were conceded away in Bundesliga. Frankfurt conceded at least 1 goal in 83% of their home matches in Bundesliga. Ajax Amsterdam have scored 2 goals or more in each of their last 9 matches in Eredivisie. Heerenveen conceded at least 1 goal in each of their last 7 home matches in Eredivisie. FC Utrecht have scored in each of their last 9 matches in Eredivisie. Heerenveen conceded at least 1 goal in each of their last 7 matches in Eredivisie. Ajax Amsterdam have won their last 9 matches in Eredivisie. Heerenveen have scored 62% of their goals away in Eredivisie. FC Utrecht have scored in 71% of their away matches in Eredivisie. Ajax Amsterdam have been undefeated in their last 9 matches in Eredivisie. Heerenveen conceded at least 1 goal in 100% of their home matches in Eredivisie. FC Utrecht have scored 73% of their goals at home in Eredivisie. Ajax Amsterdam have scored in each of their last 9 matches in Eredivisie. 67% of Heerenveen’s matches had over 2.5 goals scored in Eredivisie. FC Utrecht have scored 2 goals or more in each of their last 3 matches in Eredivisie. 73% of Ajax Amsterdam’s matches had over 2.5 goals scored in Eredivisie. Ajax Amsterdam have scored in 100% of their home matches in Eredivisie. 71% of Ajax Amsterdam’s conceded goals occured in the first half in Eredivisie. 33% of De Graafschap’s conceded goals occurred after the 75th minute in Eredivisie. Ajax Amsterdam have scored 2 goals or more in each of their last 6 home matches in Eredivisie. Ajax Amsterdam have won their last 6 home matches in Eredivisie. Ajax Amsterdam were leading at halftime in 73% of their matches in Eredivisie. De Graafschap have conceded the opening goal in 73% of their matches in Eredivisie. Ajax Amsterdam have scored the opening goal in 87% of their matches in Eredivisie. De Graafschap were losing at halftime in 60% of their matches in Eredivisie.